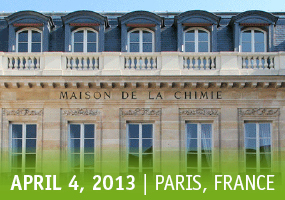 The French Society of Medicinal Chemistry (SCT) is pleased to announce the first edition of the SCT Workshop on “Biologically Relevant Molecular Diversity”, scheduled to be held on April 4th in Paris, France. This one-day meeting is organised in addition to the annual “International Conference on Medicinal Chemistry” (RICT) (July 3-5, 2013, Nice) and the “Young Researchers Days” (February 2013), to better meet the needs of the SCT partners. The aim of this first SCT workshop is to provide medicinal chemists with state of the art methods and best practices in molecular diversity analysis of chemical libraries and compound collections. The workshop is meant to present and to discuss methods and strategies to analyse and optimise the molecular diversity of libraries covering library design, library comparison, and compound selection for the optimisation of compound collections in order to increase the probability of identifying high quality hits. Eight opinion leaders, internationally recognised as experts in the field of diversity, with an emphasis on the molecular aspects of molecules – biological targets interactions, have been invited to give a presentation.